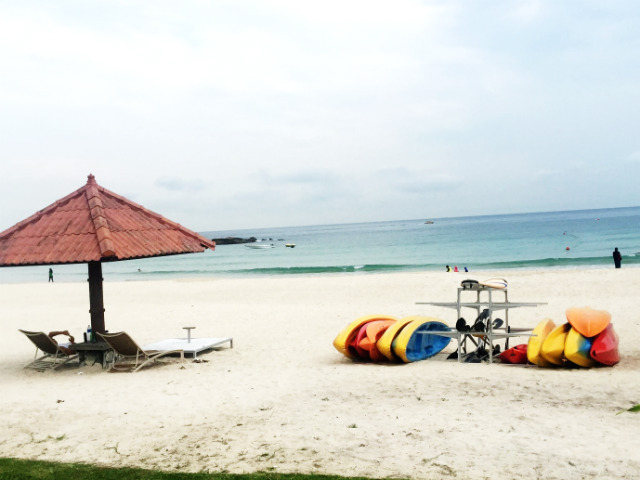 I would like to share my personal review of Bintan Lagoon Resort, as I have stayed there on my trip to Bintan Island. An easy ferry ride from the Tanah Merah port in Singapore will bring you to this plush resort that stands its ground on the shores of the Pasir Panjang Beach. It is one of the most popular weekend trips for Singaporeans and also other tourists from neigboring countries who are looking for some sun and sea, relaxation, family time, good food and some fun. 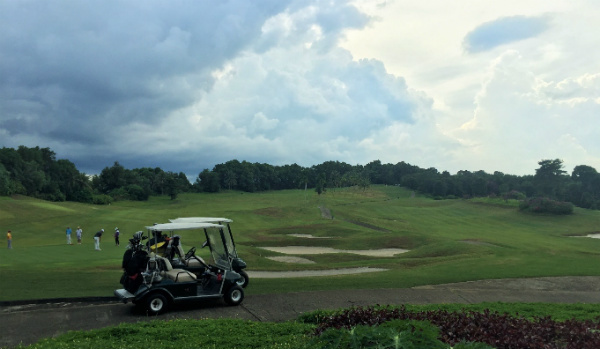 Bintan Island is also known for its top-class golfing courses, making it one of the most sought-after golfers’ paradise. 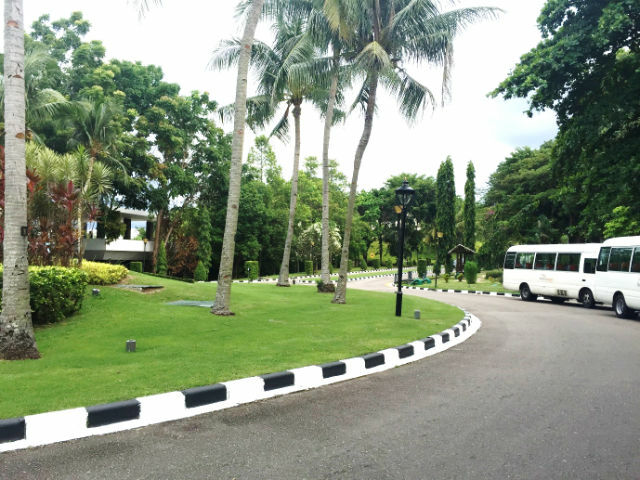 Bintan Lagoon Resort * boasts of 300 hectares (740 acres) of lush green grounds and, more importantly, a private beach. One, hop into the direct high-speed ferry ride operated by the Mozaic Ferry Lines that’ll take you straight to Bintan Lagoon Resort ferry terminal in all of 75 minutes. This way you can avoid the long immigration queues and hassles of a public ferry terminal, and enjoy a beautiful ride directly to your resort. 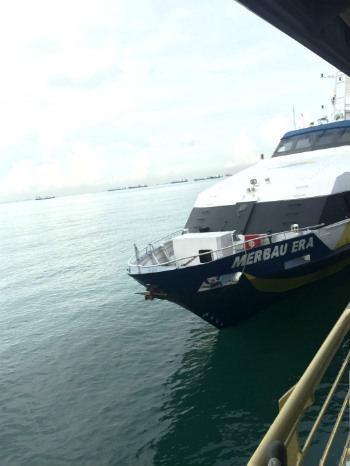 Two, opt for the public ferry services plying to Bandar Bentan Telani Ferry Terminal in Bintan. The ferry rides are pretty comfortable and, upon landing, you can either avail the public shuttle transfers or arrange for an exclusive ride to the resort. The ferry ride fares differ depending on season and day of the week. So it’s best to look up the current fares before booking. I went in the month of November and paid close to S$70 for a roundtrip. 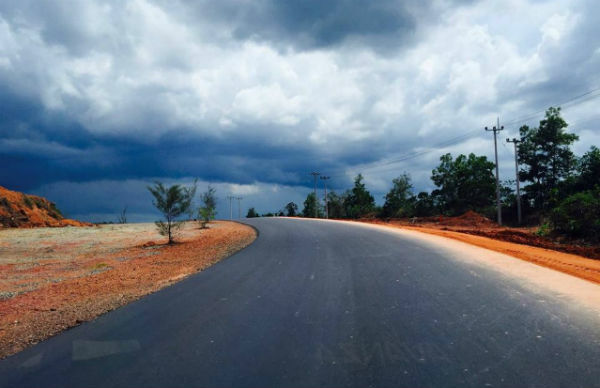 Note: The Bintan Lagoon Resort suspends its personal ferry service from December-February due to monsoons, and provides resort shuttles for guests landing at the public ferry terminal. Direct services resume from March. We ended up experiencing both the options mainly because we booked too late and did not get tickets directly to the resort while going, but managed our return tickets via the direct Mozaic Ferry Lines. It turned out to be great! 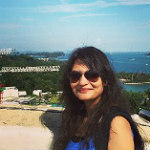 We took the public ferry on a beautiful, sunny morning in Singapore and reached Bandar Bentan Telani, and arranged for a car to take us to Bintan Lagoon Resort. It would take over an hour, we were told. Just as we were cursing ourselves for procrastinating over tickets, the busy town gave way to beautiful winding roads and red earthy scenes. The clouds had gathered in the sky, and it was one of the best car rides of my life. This modern resort is strategically located on the Pasir Panjang beach, which is approximately two hours away from both Bintan’s capital, Tanjung Pinang (73 km) and the Chinese fishing village of Senggarang (76 km), which are both major tourist destinations. Getting around the island is easy enough, with most resorts offering to book taxis or help you rent a car for the day. You can look up Indorent Car Rent for rented vehicles, or Adventure Scooter if you want to go zipping past the countryside in a two-wheeler. The first thought that crossed my mind on reaching the resort was how big and green it was. All of 740 hectares and cradling one of Indonesia’s best golf courses, I could see why people throng to this place for short weekend getaways. Boasting around 470 Indonesian-style rooms, the resort features two outdoor swimming pools, a state-of-the-art indoor gym, an indoor gym for kids, a tennis court, and two world-class golf courses – the Jack Nicklaus Seaview Golf Course and the Ian Baker-Finch Woodlands Golf Course. The fine-dining restaurants and cafes serve some delicious Asian, Japanese, Indian, and Western cuisine along with the local Indonesian dishes. The pool-side bar called the Verandah looked quite tempting as did the Terrace Sports Bar which was quite packed with many guests chilling with drinks and watching live games on the big-screen TVs, although we did not get the chance to visit them. My friends and I headed for our lunch at Haskell’s, a charming 12-hour cafe offering food and light snacks anytime between 10:00AM to 10:00PM. Our eyes feasted on the spectacular view of the golf course, while we finally sat with some food and beer after the long journey. I settled for burger and fries, and my friend went for their buffet that was a mix of Indonesian and Western cuisine and was pretty decent too. The buffet was close to Rp700,000 per person, while the a-la-carte menu offered various items starting from Rp150,000. The resort rooms were quite nice; we had taken sea-view deluxe rooms and it was very refreshing to sit on the balcony and take in the view. The rooms had all the standard amenities like a flat-screen TV, four-poster bed, Wi-Fi facilities, tea and coffee makers, hair dryer, minibar, but what caught our attention was the private massage space. It was a big Indonesian-style space with pillows and formed a part of each room. Of course, you could always get your senses soothed at one of the resort’s luxurious spas that include the Javanese and South China Seas special body treatments, along with the more common foot reflexology and neck and back rubs. They even have a massage area by the sea for guests preferring an on-the-beach experience. The prices of the treatments start from S$60 and go on up to S$350. Tip: Should you look for cheaper spa treatments, go exploring the neighboring parts of Pasar Oleh and indulge in a full 90-minute body massage for as much as Rp500,000, although you may have to compromise on the ambience. Though we didn’t have any time to order any room service in our one-night visit, we were comforted by the fact that it’s a 24-hour thing and kept that as the fall-back option. Some suites and private villas also have whirlpool tubs: something we read about while looking for budget rooms in the resort. Maybe, next time! We spent a part of the evening in the entertainment zone which wasn’t the best we’ve seen. For starters, it was empty and didn’t exactly leave us spoilt for choices. You can give this a miss. 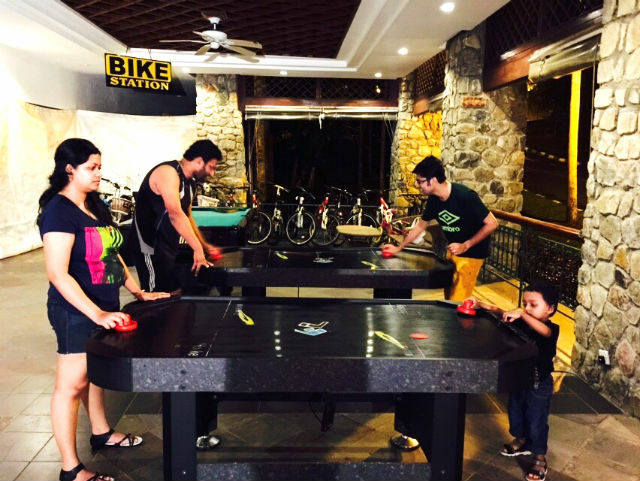 Since we had a kid with us, we spent some time playing pool and air hockey. It also had a foosball table and a bunch of bikes for rent. However, the lobby seemed to be quite the chill-out zone and was buzzing with guests simply lounging in the chairs or snacking on something from Mojo Café that serves light nibbles and fresh coffee. The reason might also be that the Wi-Fi connection is strongest in this area! You can also while away your time at the quaint shops selling souvenirs and swimming gears, though we suspect they are at a much higher price than that available outside the resort. Tip: If you’re a golfer, carry your own equipment as the resort charges an excruciating price for both rent and sale. Stretching over 1.7 km, the private beach is absolutely beautiful. This is definitely a plus point in my review of Bintan Lagoon Resort. The white sandy beach complements the clear blue sea which is ideal for both a leisurely swim and some water sports. The resort offers packages for everything from banana boat rides, jet skiing, kayaking, snorkelling, surfing, boarding, and canoeing. We spent a great evening picking shells, getting our feet wet, and watching a glorious sunset, after which we headed towards the beautiful Nelayan café for some great seafood. Formerly known as Rice, this dining space is right on the beach and offers a cosy ambience amid the sound of crashing waves and soothing sea wind. We enjoyed their pork ribs but the Wasabi prawns sent us to food coma, and I wouldn’t mind going back again just for those jumbo prawns. 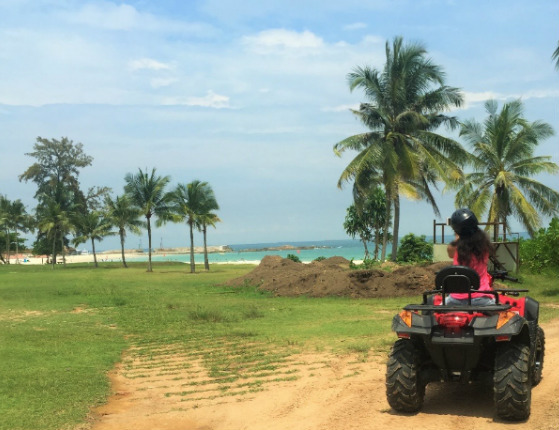 The next morning, right before we returned home, we revisited the beach – this time to try our hands at some of the exciting land activities the resort offers, like ATV tours, beach volleyball, electric car/bike rides, and Segway among other things. Given limited time in hand, we decided on a 15-minute ATV ride through the jungles lining the beach. The guide took us on the ATV trail, which was both scary (for first-timers) and exhilarating, and left me with a very satisfying sense of accomplishment on completing it. We took single-seater rides, which cost us around S$40 for 15 minutes, while a 30-minute ride and a 60-minute ride would cost S$66 and S$110 respectively. The costs will jump another S$20, approximately, if you go for the double seaters. And then, just like that, it was time to go back home. As we dragged our feet back to the Bintan Lagoon Resort ferry terminal, we longed for one more night – usually the sign of the end of a wonderful holiday. There was so much more to explore within the resort itself that I’m definitely going back for more. To sum my review up, I would recommend staying at the Bintan Lagoon Resort * as it’s a one-stop shop for all holiday activities. Irrespective of whether you are going there with your friends or family, there’s something for everyone. Although the room rates are higher than other resorts, watch out for their super deals online. 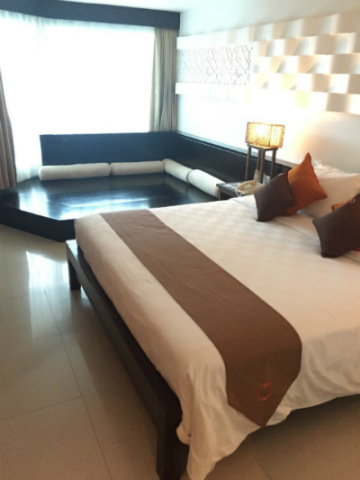 It was how we managed to get great rooms at a very reasonable price – around S$88 per night per room. There are negatives and positives for every holiday resort. My recommendation is based on direct ferry access from Singapore, nice rooms, great private beach, water sports and land activities, kids’ play area, and delicious seafood at the beachfront restaurant. So, next time you’re planning a short trip, give this destination a thought.